The Salt Lake Tribune reports Trump will travel to Utah to announce he's scaling back Bears Ears and Grand Staircase-Escalante national monuments. Two national monuments in Utah are reportedly about to get significantly smaller. The Salt Lake Tribune reports President Donald Trump is expected to announce Monday he'll shrink the Bears Ears and Grand Staircase-Escalante monuments. 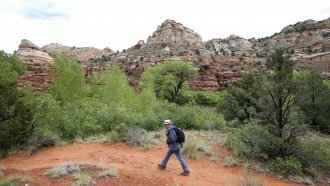 The outlet says Bears Ears might shrink to about 180,000 acres from its current 1.35 million. Grand Staircase-Escalante, which is currently about 1.9 million, could be cut by half. Trump's expected announcement would follow recommendations from Interior Secretary Ryan Zinke. In an executive order from April, Trump asked Zinke to review certain monuments designated under the Antiquities Act dating back to 1996. Former President Barack Obama designated Bears Ears before he left office. Bill Clinton designated Grand Staircase-Escalante in 1996. Scaling back the monuments comes with controversy. Bears Ears is sacred to several Native American tribes, and some have already threatened to sue. Plus, while the White House can definitely establish monuments, it's not clear if it can alter or remove them.